After a much laborious attempt to “deconstruct” SI’s latest exhibition yesterday, I want to write a post just about looking at colors. This exhibition, The Thingness Of Color at Dodge has just want I am in the mood for, lots and lots of brilliant colors. These two pieces makes me think of paper collages made out of Japanese origami papers. I remember in high school when I use to buy them in packages of multiple colors in hopes to get just one or two sheets of my favorite kind, the golden colored papers. Those gold papers are slightly different from the ordinary colored papers because they come with a smoother and shiner surface. In these works as seen here, aside from the overall interesting mix of textures and surfaces, I really like the juxtapositions of the individual colored and patterned pieces. Notice how they are not strictly geometric with hard-edges like in pure minimalism, but the shapes take on softer and more curvaceous outlines. 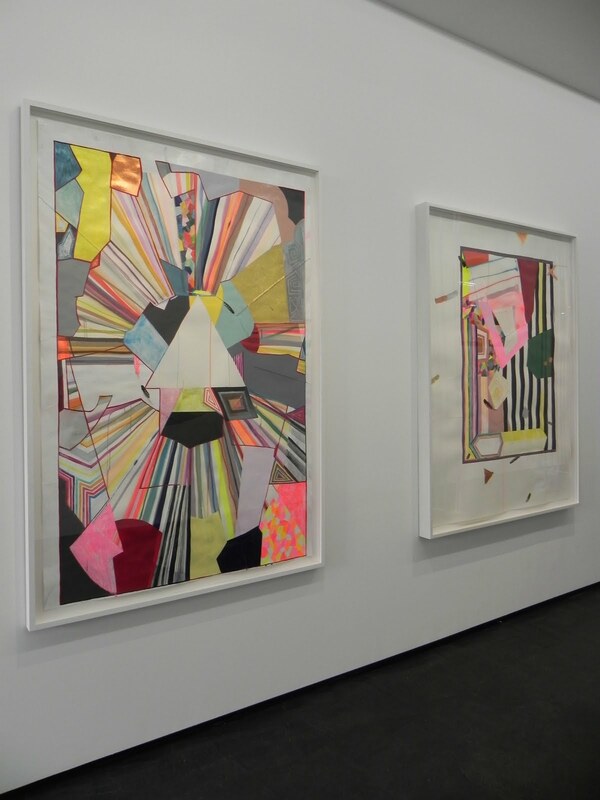 Especially in the piece that is placed a little further in the background, it looks as if artist, Sarah Cain is intentionally trying to violate the grid by sprinkling specs of coloring geometries outside the frame. This sculpture by Cordy Ryman reminds me a little of So LeWit and also a little of Carlos Cruz-Díez. It is probably easier to see the reference of So LeWit than any reference to Carlos Cruz-Díez. The Cruz-Díez reference is mainly in the way how the colors are applied to the structure that somehow produces this sense of visual vibration (kind of like moiré pattern) to the spectator when looking at this piece. Not clearly shown in my image is that there are thin strips of bright neon red-orange color painted underneath the bars of cool light washes of blue juxtaposed with white. For the same reason that I like Cruz-Díez’s pieces is this sense of visual vibration that comes from the apparently inanimate object. In this last image of a sculpture, installation or intervention (I am not sure how to classify this) but what I like about this piece by Franklin Evans is its physical integration with the architecture of the space. These are colored tapes that go from ceiling to floor that inevitably makes me think of this is what it would be like if Jim Lambie decides to go vertical. Although I must say, looking up closely, Evans is working less strictly in primary colors but also incorporating secondary colors along with some strips in multi-color schemes, even in various patterns that added more visual texture. The Thingness Of Color is up at Dodge until May 8.